After sacrificing their lives in the battle against the Maute group to save Marawi City, a group of lawyers in Lanao del Sur allegedly accused them of ransacking houses and stealing valuable things from civilians during the clearing operations. According to the Maranao lawyers, while they supported and recognized the “constitutional prerogative” of President Rodrigo Duterte to proclaim martial law in Mindanao to contain the problem of extremism, they were apprehensive of what would become of Marawi City. They are also concerned about "reports of callous military men who disregard human rights and who destroy or take away random properties of civilians in conducting its house-to-house searches." “As a consequence of illegal searches and seizures, rampant loss of valuable personal belongings of innocent and helpless civilians has been reported,” the IBP said. Due to this statement, one irate soldier wrote a rebuttal defending his colleagues from the malicious accusations thrown at them by the members of the Integrated Bar of the Philippines (IBP). 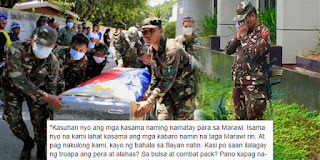 The soldier challenged the lawyers to file a complaint against them including those troops who were already killed in action in Marawi, while asking if they received reports that the authorities recovered money and jewelries from his fallen comrades. "Binabaliktad ang pangyayari. Malamang ang mga lawyers na ito ay kasabwat sa mga terorista at malaking yaman ang mawawala kung ito ay mapupunta sa gobyerno. Yamang nakadeklara ang martial law at suspendido ang writ of habeas corpus dapat ang mga ito imbistigahan at kung kinakailangan ikulong sa malamig na rehas"
Contrary to the accusations of the Maranao lawyers, soldiers turned over huge amount of money amounting to P79 million in cash and checks that they found in the vault of an abandoned house in Marawi.